[Miss Williams’ narrative] I picked up a torn skirt which she had left lying on the floor and took it down with me for her to mend after breakfast. observations: To Robert Barnard, it was the best Christie of all, and he makes his case very persuasively in his excellent book on AC, A Talent to Deceive. I’ll only commit to a Top 5 of her books, and keep changing my mind for an order amongst them, but Five Little Pigs is definitely in there. But of one thing I’m in no doubt: the 2003 TV version of the book is the best Christie adaptation by far. It is superbly well-done, with wonderful camerawork, settings, lighting, costumes, make-up, acting - everything is perfect. If it had been released as a feature film it could have won Oscars. Throughout there is an air of aching sadness, a feeling for lost summers, times past, misunderstandings and missed opportunities... and that most Proust-ian music, Satie’s Gnossienes, is playing gently in the background. The characters are all looking back on their past and wondering what became of them. For once Poirot really does look at the psychology (normally he claims to do so, then goes out looking for ordinary clues.) Among the many perceptive subtleties is Christie’s take on a child who is much-loved, but suffers from the fact that her parents are completely wrapped up in each other. All the acting is tremendous, but there are two points of particular interest. Gemma Jones plays the governess, Miss Williams, and you come away thinking she was BORN to play Miss Marple: she would be perfect in the role – not fussy or annoying, but sharp and firm. She really, really ought to be the next one to take this role. And, Toby Stephens plays a very nuanced version of Philip Blake, looking just like the Duke of Windsor – he should surely play that role some day. Crime writer Martin Edwards (we keep doing the same books) has seen a current production of a stage play based on the book – see his comments on his blog here. 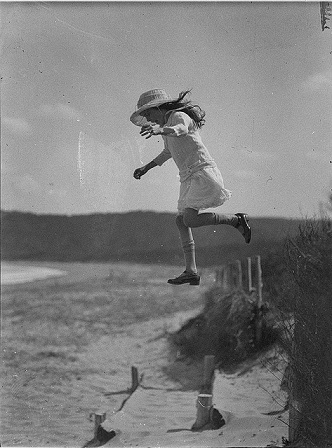 The picture – by blog favourite Sam Hood, from the State Library of New South Wales – looks like a still from the film: it is very much in the same style, though of course it was contemporary when the photo was taken. She could be Carla, or Angela, or even the young Caroline. Below, a screengrab from the film, Amyas Crale is painting Elsa Greer. Moira - I like this novel very much as well. In this one I see a lot of subtlety of character that you don't always see in Christie's novels, and of course the mystery is a good one. I also love the different perceptions we get of Caroline Crale. And I thought the adaptation was terrific too. It did take a few liberties as you say, but in a lot of ways it was quite wonderful. Moira and Margot- I am afraid I am a grumpy old dinosaur when it comes to liberties taken by TV in making alterations in plots and characters. Five Little Pigs is definitely one of Christie's best novels, but the changes in the TV version were unnecessary. When people accept these alterations TV producers get carried away and insert Miss Marple into the plot of Endless Night. Uriah: I do know what you mean, because I have felt that way about other adaptations. You are probably quite right to take a purist line! I'm arbitrary - I think it's OK when I happen to like the results, and execrable when I don't. It's not my favourite Christie partly, I think, because the story's so sad. It's one I rarely reread anyway. I think the image of the girl you've chosen. Definitely the feel of lost childhood/innocence there. I am reading my way gradually through the Christie mysteries, and if I read in order, it will be a ways before I reach this one. Good to know that you really like this one. I think this might be one of the few I have read, albeit 30+ years ago. I might try and find a copy if it's in the top 5. Thanks all, I really do like and recommend this book, though Sarah is absolutely right, it is very sad. And I'm very pleased with that top picture! Sounds quite good...thanks for sharing. Stopping by from Carole's Books You Loved June Edition. I am in the list as #31.